The DEWALT DW735 13-Inch, Two Speed Thickness Planer - Power Planers is an ideal choice for both carpenters as well as the occasional DIY aficionado. It is an easy to use model, if you read the instructions carefully that is. I do think it is well-worth an investment, especially since I’m really into working with reclaimed wood right now. I want to help you come to a well-informed decision in regards to finding a good planer…so I created this review and guide. I hope this will come in handy. While they might seem a bit of an expensive purchase at first sight, I find benchtop planers a good, long-term investment. A good model will more than pay up for its initial price in the long run. Previously dimensioning panels by hand (horrible, let me tell you), there was always a bit of a problem when it came down to matching the dimensions for every single board. Having the Dewalt in my life does eliminate any hassle and I find more work can be done in a shorter amount of time. As a freelance carpenter, I have to say I wish I had this planer sooner. The machine gives a nice finish to any type of wood (hard as well as soft), making it a nice addition for a home shop. I believe nothing beats owning a planer when you want to smooth and mill boards to an exact thickness. While this is not by any means an industrial-type planer, I do find it a great option for carpenters. It is an easy to carry, portable model (about 90 pounds), a feature you will find sets it aside from the older, monster-like versions. Hobbyists can also use this planer as it is very easy to work with. Even if you are just trying to remodel your home by yourself I believe you will find this gadget very handy. You will not regret the investment. And while I am not a full-time carpenter, I do work mostly with reclaimed wood and I find this planer a pretty powerful, easy to use option. Any wood worker will tell you that any finished piece is only as good as the material used. Here is when a high-performance planer comes in handy. Most of the better models feature double-edged, self-indexing knives. Choosing a planer without this option will be extremely time-consuming and fussy to deal with. It is also best to look for a wood planer with an automatic cutter-head lock. This will prevent the head from rotating while you are in the process of removing bolts and knives. This is an important factor for most buyers. That being said, we found out that most models nowadays are quite good in handling even the hardest wood varieties like oak and maple. Any good planer will indicate how much wood will be removed at every single pass. Gauges will avoid you from biting too much into the work piece. You should also look for a model with an adjustable depth that will help you avoid planning a board thinner than you previously targeted. Any planer will generate its fair amount of dust and wood chips. That being said, you should choose one with a good, hard-working dust collector or vacuum system. Some of the best models on the market even have an incorporated fan that is perfect at sucking chips away from the cutter-head and blowing them towards the collection system. The Dewalt planer is a powerful model with a 15-amp, 20,000 rotations/ minute motor, meaning that it will be able to cut into wider materials quite easily. Its 3-knives cutter-head does have a long knife life and you will find changing the knives extremely easy. You might also like the two-speed gearbox that allows you to change feed speed without any hassle. Another good feature comes in the form of the fan-assisted ejection, and I think this does an admirable job at vacuuming out any chips and exhaust of the cutter-head. This 13’’ planer will allow you to obtain deep, very clean cuts even through the hardest wood variety. The cutter-board equipped with 3 knives, topped with a two-speed gearbox delivers 96 or 179 cuts per every inch (cpi). I recommend you use the 96 cpi mainly for dimensioning materials and the 179 cpi for having a finer, well-polished finish. This particular planer has a very long infeed and out-feed tables, providing 33-1/2 inches of material support. If you desire to keep the planer at a commonly used depth, you will find that the turret depth will save you time. The 4-carriage lock will also reduce any potential movement leading to material damage. The DEWALT DW735 13-Inch, Two Speed Thickness Planer comes equipped with a high-performance ejection system. You will find the motorized fan pretty good at breaking down all debris leaving the cutter-head and blowing it into a dust shroud. The machine actually has two dust shrouds – one for dispersing the wood chips down onto your shop floor and one providing a connection to either a vacuum hose or a dust collector one. When I started thinking enough was enough and decided to purchase this product I did my best to educate myself on every single aspect about it. As the internet provides countless information on everything you could possibly want, I searched for reviews on the DEWALT DW735 13-Inch, Two Speed Thickness Planer. Of course, like it is the case with everything on the market, there were people who disliked this planer. One particular user said that the motor blew up after just a few weeks and some even stated that the blades were not as good. However, as I didn’t experience anything along these lines, I have to think they were not using the planer accordingly. On a better note, one reviewer did say this unit helped them to work better, faster and that it was vastly cheaper than others its king which were not as high-performance. Another person particularly liked the finish this planer left on the wood, both hard and soft. One thing I have to further say, mainly as some people found it hard to switch between the blades, is the fact that it is actually quite simple if you thoroughly read the instructions. No room for misinterpretation here…most people who did this seemed to also state it works perfectly fine. Though I really like the DEWALT DW735 13-Inch, Two Speed Thickness Planer, I do consider it a smart move to look at other models present on the market. You might find another one more suitable for your particular needs. While only having a motor that allows 20,000 rpm, as opposed to the 30,000 rpm of the Dewalt DW735, this model is also a nice option to consider. You will also like the long-lasting knives with about 30% more lifetime and the good, and the very long infeed and out-feed tables, providing 33-1/2 inches of material support. 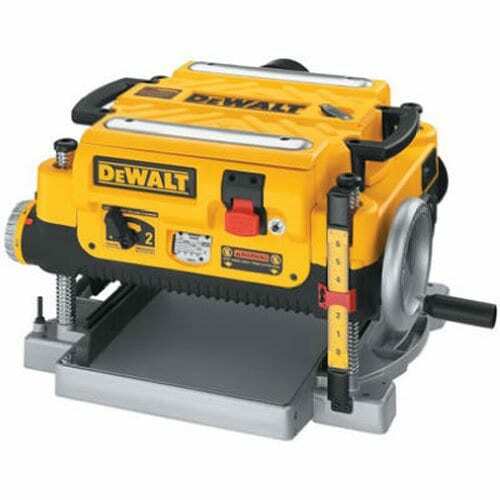 What makes this planer different from the Dewalt DW753 comes in the finish it provides wood with. The 3-knives cutter-head provides 96 cuts per inch, and while one of the finest finishes when it comes to planers, it cannot compare with the 179 of the Dewalt DW753. As compared with the Dewalt DW&35, this model prides itself on being very low noise, making only about 83dB, which is a nice touch in our opinion. The blades are also quite easy to change, and the 4-post design and diagonal cross gives it a good stability. What I personally find interesting about the Makita is that it comes equipped with large table extensions, making it a lot easier to support certain work pieces. The incorporated LED light that indicates if the planner is plugged into the power source is also a nice addition. You might like the fact that it is lighter than the Dewalt, coming up to only 62 pounds and that it requires a voltage of 120, as opposed to the 110 of the Dewalt. Also quite a good option is this model from Delta. Equipped with a 15A motor and a 4-column design, this planer will be of great help in your workshop. It does provide a good amount of stability, and has adjustable infeed and out-feed tables, great for handling longer wood pieces. What sets it apart from other models is the fact that it is really light, coming up at 58 pounds, a good feature in my opinion. This does not take from its power or usefulness however. Most users do like the Delta, especially if they have a small work space and not engage in everyday planning. Being on the heavier side, with 78 pounds in weight, the Grizzly is another option to take into account. We do like the fact that, unlike many other wood planers, this one will allow you to work with both measurement systems. You might also appreciate the fact that it does come with a deflector shield and that it is overall a good, solid planer that will last for a long time. It is made of real steel, after all. Many users find it quite accurate and easy to work with. Considering my preference for working with reclaimed wood, not the smoothest surface or the same hardness every time, it should come to no surprise as to why I opted to invest in a wood planer. Though not the cheapest toy to buy if you are just planning to use it as a hobby, regular wood workers like myself will find opting for one is far cheaper in the long run. The DEWALT DW735 13-Inch, Two Speed Thickness Planer is a great option to use on a daily basis. To save some money, it's best find and compare the best prices online for the DW735. Its two-speed gearbox will allows you to change feed speed without any hassle and the fan-assisted ejection works without any problem. I do like this model better than others of its kind and find that its powerful motor and high quality blades are pretty good at tackling even the hardest of wood varieties.